Although most people will be unfamiliar with the majority of products you use in your medical practice, there is one exception to the rule: BOTOX®. Since it first gained approval as a wrinkle treatment in the U.S. in 2002, BOTOX® has become a household name. Even if they have never had a cosmetic treatment in their life, most people are familiar with this botulinum toxin brand name and its ability to smooth the appearance of wrinkles. Although not everyone completely understands what BOTOX® is and how it works, they do correctly associate the toxin with wrinkles. However, its success as a wrinkle treatment often overshadows this toxin's history and its wide variety of other medical uses. It seems like scientists are always announcing a new use for this wonder drug and it can be hard to keep up with all its uses, but we decided to delve into a few of the most popular, and most interesting, uses for BOTOX®. 1. BOTOX® as a . . . Military Weapon? Scientists first identified botulinum toxin in the early 1800s, noting how this toxic bacterial product could cause serious illness and even death. During World War II, other scientists revisited this powerful neurotoxin as a potential military weapon, thinking its ability to cause paralysis could prove useful in the war. Luckily the war ended, and the researchers gave academics information about their techniques for isolating and concentrating this toxin so they could learn more about this deadly substance. The military researchers likely never imagined the toxin would one day become one of the most popular anti-aging treatments. Crossed eyes, called strabismus, make life difficult for patients, but up until the late 1970s, the only option was surgery. Ophthalmologists set out to find a better option, investigating different anesthetics, enzymes, and even neurotoxins from snakes. When they tried botulinum toxin, the researchers decided they had a winner: the toxin was able to paralyze only the targeted muscle, had long-lasting effects, and seemed free of side effects. Starting in 1977, patients with stabismus had their eyes realigned with a simple injection into the appropriate muscle. Doctors soon expanded the treatments to include other eye muscle disorders such as eyelid twitching, called blepharospasm. Dystonia, or sustained muscle spasms, can be painful, distracting, and even embarrassing for patients. Torticollis in particular involves twisting of the neck muscles, which besides being painful causes a tilted head position. Doctors soon discovered botulinum toxin could help relax these muscles back into a normal position, and cervical dystonia patients quickly spread the word about this new miracle treatment. The treatment then expanded to help other muscle problems, such as spasms associated with stroke and cerebral palsy. While sweating is a natural, and necessary, way of cooling the body, some people sweat excessively. Although this condition, called hyperhidrosis, can be treated, these treatments do not always work. While using botulinum toxin to treat facial spasms, doctors discovered an interesting side effect: the toxin inhibits sweating. Doctors now use BOTOX® to treat excessive underarm sweating, helping patients avoid this embarrassing medical condition. Surprisingly, some women are using BOTOX® injections to help maintain their beautiful hair. A sweaty forehead can ruin a hairstyle, but some are opting for botulinum toxin injections to reduce their forehead sweat and keep their blowout looking better, longer. Despite how common they are, researchers still struggle to fully understand Migraines. These chronic headaches are a bane to the many who experience them, causing a range of symptoms like pain, pressure, light and sound sensitivity, dizziness, and nausea. Although migraine drugs do exist, they do not always work for all patients and may come with bothersome side effects. In 2010, BOTOX® received approval to treat chronic migraine, helping relax some of the symptoms by relaxing head and neck muscles. Incontinence can be embarrassing and inconvenient, plaguing some spinal cord injury or multiple sclerosis patients. BOTOX® received approval to treat incontinence in 2011, helping relax muscles and allowing the bladder to hold more urine, longer. This helps patients avoid embarrassing spills and feel more comfortable. Lock jaw, TMJ disorder, and severe jaw tension can cause pain and discomfort. Although it is not officially approved for this use, some doctors use BOTOX® to relax jaw muscles and reduce these jaw conditions. Cosmetically, BOTOX® injections can also help soften the look of the jaw to a more feminine appearance. Although BOTOX® can help relax muscles to reduce the look of wrinkles, some cosmetic surgeons have discovered the injections can also treat other aesthetic problems. Injected into the correct area, the toxin can help give patients an eyebrow lift, weakening the muscles that pull the eyebrows down so they appear more elevated, youthful, and awake. Relaxing mouth muscles can also help a condition some refer to as a gummy smile, where smiling shows too many teeth. By relaxing the muscles that control the upper lip, the lip position lowers to reveal fewer teeth when smiling. This may be one of the more surprising uses of BOTOX®, but researchers have discovered injections of this neurotoxin can actually help increase feelings of well-being. The scientists believe this works by softening the ability of facial muscles to express emotions, stopping the cycle of someone feeling depressed, expressing this in their facial muscles, and reinforcing the feeling of depression. With their face more relaxed, the patients in the study seemed to feel less depressed. You thought your patients were just happy to see their wrinkles disappear! It seems like researchers are announcing more potential uses for BOTOX® all the time. Although most people associate this toxin with wrinkle treatments, awareness is growing for just how much this versatile injectable can accomplish. 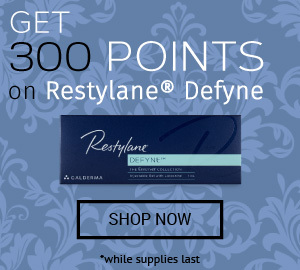 To buy BOTOX® or other botulinum toxin products, visit DoctorMedica.co.